No, seriously. Some of these so called writing rules are not so much rules, but preferences (and sometimes, just made up stuff to make people who don’t know them feel stupid). The key with all rule breaking, of course, is to know why the rule exists in the first place (if it really is a rule) so that you can break it, without committing the sin it was designed to avoid. Here are some ideas. Not always, especially in a series. Sherlock Holmes never really changed on a macro level. Barely ever on a micro-level, either. And that’s why we love him. If your character doesn’t change, okay. Make not-changing a defining characteristic. Just be sure your character still has obstacles to overcome, or you might not have a story. Please, go and boldly split those infinitives. It’s okay. The problem isn’t the prologue, it’s starting the story in the wrong place. A lot of great stories have effective, and well done prologues. This rule should be, never say “It was a dark and stormy night…” but even then, are you really going to knock Snoopy like that? That’s how all his novels start. There’s nothing wrong with the weather, but the sin here is usually starting in the least of all important places for your story. Maybe your first sentence shouldn’t be about gathering rain clouds, but a little mood — especially if the weather contributes to it and makes sense, won’t destroy the universe. Oh, Strunk and White. If you own their seminal book on grammar and usage, throw it out. It’s awful. Especially the section on passive voice because it seems they’re not even sure what passive voice is. While active writing generally feels and reads better, there will be times when passive voice is the simplest, most direct construction that sounds best. Use it. The world will not end. Blah! Strunk and White strike again. This is absolutely appropriate usage, no matter what their awful book or your English teacher tried to tell you. Just make sure you’re not looking for “how ever” in stead of “however,” (i.e. how ever did you find me!). Pick the right answer: A) He held up the vase that was broken. Or B) He held up the vase which was broken. The answer is both. While A is more common in American English, B is not incorrect (and very common in the UK). I’ll leave you to guess who we have to thank for what I call the Copyeditor’s A+ Number One Favorite Rule Ever, but if you read enough classic—and highly respected literature—you’ll see they weren’t aware someone would someday feel the need to confuse writers with pointless rules like this one. You can aspire to their level. 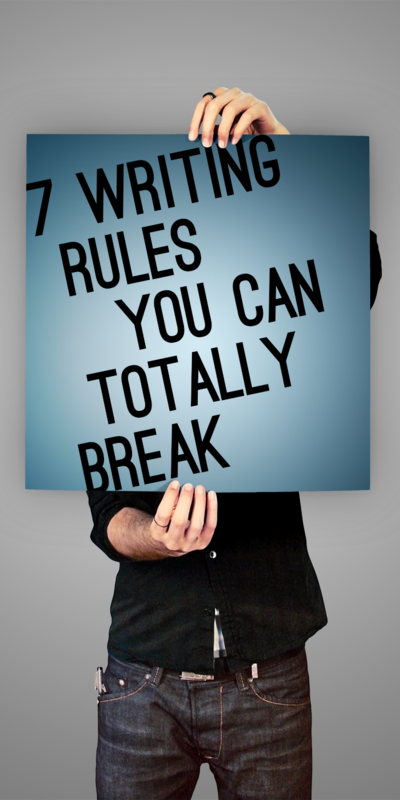 What rules do you always break?